Enlarge Loudspeaker cable, 2 x 3.0mm², silver plated. 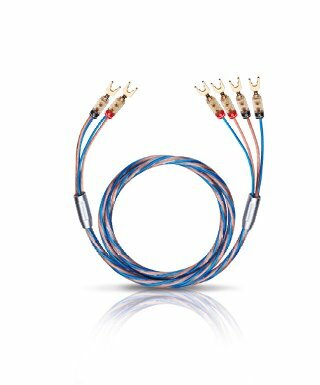 High-quality and particularly flexible stereo loudspeaker cable for connecting amplifiers and power amplifiers to loudspeaker boxes. This loudspeaker cable is suitable for amplifier performances of up to around 350 watts of power per amplifier channel. The cable is manufactured from three stranded strings of oxygen-free copper (OFC) and three stranded strings of silver-plated oxygen-free copper (SPC). The proportion of silver-plated conductors means that this special design considerably improves transmission properties, particularly in the treble/mid-tone range! This Oehlbach cable's outer sheath is made from a tough, transparent and highly flexible mix of plastics for very supple and flexible laying. Enlarge Loudspeaker cable, 2 x 6.0mm², silver plated. High-quality and particularly flexible stereo loudspeaker cable for connecting amplifiers and power amplifiers to loudspeaker boxes. This loudspeaker cable is suitable for amplifier performances of up to around 350 watts of power per amplifier channel. The cable is manufactured from three stranded strings of oxygen-free copper (OFC) and three stranded strings of silver-plated oxygen-free copper (SPC). The proportion of silver-plated conductors means that this special design considerably improves transmission properties, particularly in the treble/mid-tone range! This Oehlbach cable's outer sheath is made from a tough, transparent and highly flexible mix of plastics for very supple and flexible laying. 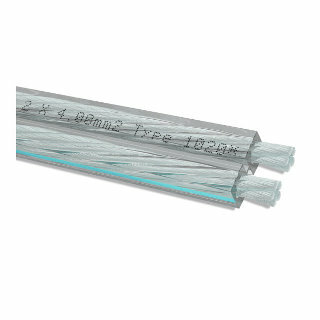 Enlarge Loudspeaker cable bi-wiring, 2 x 2.5 / 2 x 4.0mm². Excellent bi-wiring loudspeaker cable in a class of its own. 2 x 2.5 mm² silver-plated oxygen-free copper for mid-tones and trebles and 2 x 4 mm² oxygen-free copper for the loss-free transmission of basses. It reproduces an impressively natural and detailed sound. The use of very high-quality materials both for the conductors as well as for the insulation guarantee great flexibility along with outstanding powerful bass and simultaneously high-resolution treble values. Loudspeaker cable, 2 x 2.5mm². 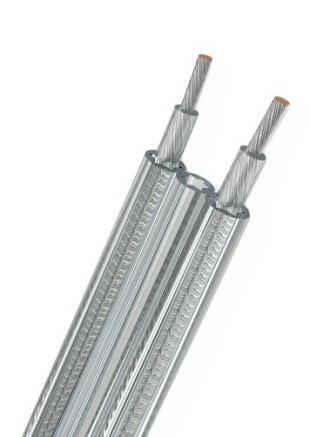 Three ingenious radiating air-tubes, which are embedded into the structure, do offer two advantages: first of all, the the cable gains an enormous stability while it is still offering an outstanding flexibility. On the other hand, the construction allowes a perfectly consistent paralellism of both conductors, which results in superb electrical parameter. 50 single twisted inner strands, measuring only 0,254 mm each, minimize the skin effect reliably. To gain further improvement in signal-transfer, we use silver plated OFC for this cable. The result is an outstanding, brillant sounding cable with an extremely high grade of neutralism. Enlarge Loudspeaker flat cable, 2 x 1.5mm², silver plated. High-quality silver-plated flexible stereo loudspeaker cable for connecting amplifiers and power amplifiers to loudspeaker boxes - for amplifiers with an output of up to around 120 watts per amplifier channel. The silver plating on the oxygen-free copper means that this loudspeaker cable produces an extremely clear and true-to-nature sound - particularly in the treble range. This Oehlbach cable also possesses better conducting properties than conventional loudspeaker cables as a result of the wire bundles it uses - which almost double the electrically conducting surface. Enlarge Loudspeaker cable, 2 x 4.0mm², silver plated. High-quality stereo loudspeaker cable for connecting amplifiers and power amplifiers to loudspeaker boxes. This loudspeaker cable is suitable for amplifier performances of up to around 250 watts of power per amplifier channel. This Oehlbach cable's outer sheath consists of a tough and flexible mix of plastics. At the same time, the inner conductor is made up of many individual wires that in turn have been twisted together to form bundles and thus produce a cable, which is extremely flexible and thus easy to lay. Oxygen-free copper (OFC) - which is known for its excellent transmission qualities - has been used as the inner conductor's material. Enlarge Loudspeaker cable, 2 x 6.0mm², silver plated. High-quality stereo loudspeaker cable for connecting amplifiers and power amplifiers to loudspeaker boxes. This loudspeaker cable is suitable for amplifier performances of up to around 300 watts of power per amplifier channel. This Oehlbach cable's outer sheath consists of a tough and flexible mix of plastics. At the same time, the inner conductor is made up of many individual wires that in turn have been twisted together to form bundles and thus produce a cable, which is extremely flexible and thus easy to lay. Oxygen-free copper (OFC) - which is known for its excellent transmission qualities - has been used as the inner conductor's material. Loudspeaker cable, flexible, 2 x 0.75mm². High-quality stereo loudspeaker. This loudspeaker cable is suitable for amplifier performances of up to around 70 watts of power per amplifier channel. This Oehlbach cable's outer sheath consists of a tough and flexible mix of plastics. At the same time, the inner conductor is made up of many individual wires that in turn have been twisted together to form bundles and thus produce a cable, which is extremely flexible and thus easy to lay. Enlarge Loudspeaker cable, flexible, 2 x 1.5mm². High-quality stereo loudspeaker cable. This loudspeaker cable is suitable for amplifier performances of up to around 110 watts of power per amplifier channel. This Oehlbach cable's outer sheath consists of a tough and flexible mix of plastics. At the same time, the inner conductor is made up of many individual wires that in turn have been twisted together to form bundles and thus produce a cable, which is extremely flexible and thus easy to lay. Enlarge Loudspeaker cable, flexible, 2 x 2.5mm². High-quality stereo loudspeaker cable. This loudspeaker cable is suitable for amplifier performances of up to around 400 watts of power per amplifier channel. This Oehlbach cable´s outer sheath consists of a tough and flexible mix of plastics. At the same time, the inner conductor is made up of many individual wires that in turn have been twisted together to form bundles and thus produce a cable, which is extremely flexible and thus easy to lay. Enlarge Loudspeaker cable, flexible, 2 x 2.5mm². High-quality stereo loudspeaker cable. This loudspeaker cable is suitable for amplifier performances of up to around 150 watts of power per amplifier channel. This Oehlbach cable's outer sheath consists of a tough and flexible mix of plastics. At the same time, the inner conductor is made up of many individual wires that in turn have been twisted together to form bundles and thus produce a cable, which is extremely flexible and thus easy to lay. Enlarge Loudspeaker cable, flexible, 2 x 4.0mm². High-quality stereo loudspeaker cable. This loudspeaker cable is suitable for amplifier performances of up to around 180 watts of power per amplifier channel. This Oehlbach cable's outer sheath consists of a tough and flexible mix of plastics. At the same time, the inner conductor is made up of many individual wires that in turn have been twisted together to form bundles and thus produce a cable, which is extremely flexible and thus easy to lay. 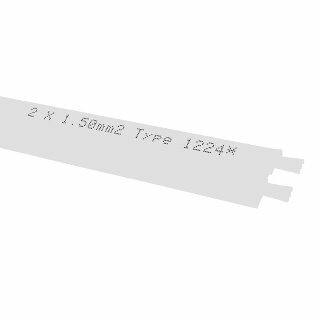 Enlarge Loudspeaker flat cable, 2 x 1.5mm². Outstanding, ultra-flat loudspeaker cable for concealed laying. Considerably improved conducting properties over conventional loudspeaker cables through adjacently positioned flat bundles of wires, which almost double the resulting electrically conducting surface. 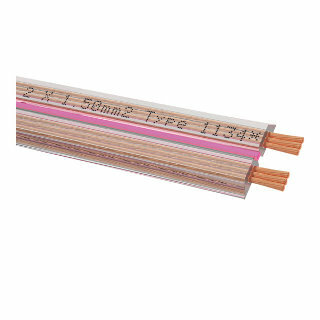 Enlarge Loudspeaker flat cable, 2 x 4.0mm². Outstanding, ultra-flat loudspeaker cable for concealed laying. Considerably improved conducting properties over conventional loudspeaker cables through adjacently positioned flat bundles of wires, which almost double the resulting electrically conducting surface.